"You are as guilty as the water or the trees or the ducks in the pond. They were all accomplices...: the water, because it did nothing but embrace him; the trees because they stood by and watched; the ducks, because he was lured by [them] - . " There is an abundance of films about the Holocaust, but very few that visit the long-term trauma suffered by its survivors�and their survivors. Based on Carl Friedman's novel, The Shovel and the Loom, actor Jeroen Krabbé's directorial debut, Left Luggage, offers an atypical perspective on the Holocaust, set 30 years later in the Belgian city of Antwerp. Chaja Silberschmidt is a student of philosophy and very much a young woman of her time: an independent wild child with little empathy or patience for her aging parents, both survivors of the death camp at Auschwitz. Her mother (Sägebrecht) is a compulsive busy-maker, baking and weaving and cooking—anything to avoid remembering what she experienced during the war. Her father (Schell) has recently begun a crusade to find the 2 suitcases he filled with family heirlooms and buried before his deportation. He wanders the Flemish city with maps and a shovel, determined to dig up the past his wife buries "under piles of cakes." When her landlady threatens eviction based on overdue rent, Chaja's friend and neighbor, Mr. Apfelschnitt (Topol), tells her of a Hassidic family in need of a nanny. Although she is Jewish, Chaja was not raised in the religion and shares the general disdain most have for the local ultra-orthodox Hassidim. Desperate for her rent, she takes the job with trepidation, almost quitting on her first day as she runs up against the many rules and restrictions of the Kalman's household. But the young woman is particularly smitten with their 4-year-old, an adorable redhead who doesn't speak, and returns for him. Over the next few months, Chaja builds a tenuous bond with Mrs. Kalman (Rossellini) and her brood, helping to defend them against their anti-Semitic concierge, encouraging the little boy to speak and eventually standing up to the tyrannical Mr. Kalman (Krabbé). As one expects from the outset, all of these characters are changed by the events portrayed, although much more subtly than imagined. The film is uneven and the screenplay seems too condensed for its rich characterizations. Laura Fraser begins as seemingly unpolished as her Chaja, but they mature together so that, by the time the story takes its sudden descent into tragedy, both actress and role rise with emotional power. The Glaswegian actress has a bit of the look and overall sense of Julia Roberts, with perhaps more potential for depth and range. Rossellini is surprisingly natural in her spare portrayal of the far-from-glamorous Mrs. Kalman, the typically overburdened woman in the misogynistic society of Hassidism. Despite being called upon to utter the film's most melodramatic line, Rossellini earned one of four awards the film was presented at the Berlin International Film Festival. Veteran Oscar®-winner Maximillian Schell is endearing as Chaja's shovel-wielding father, and I will take anything Marianne Sägebrecht (Bagdad Café) serves up, no matter how small the portion. But the sustained delight here is Chaim Topol as Mr. Apfelschnitt, a man who stands between the 2 remote aspects of a religion disfigured and ravaged by a catastrophe beyond human comprehension. Involving despite a certain awkwardness, Left Luggage fills a void in the story of the Holocaust by offering a sampling of after-effects on individuals as well as Judaism in general. It is easy to miss this story's more universal message in the wash of tears, but it serves as a summation for all of their disparate lives in the wake of disproportionate tragedy. Image Transfer Review: Presented in full-frame as opposed to the original 1.66:1, oddly, I can't say I noted any awkward cropping in any scene. The transfer is clean but nothing remarkable. Colors are subdued, which I suspect is as intended in the original. Fleshtones seem naturally pale , and black levels are sufficiently balanced. No notable artifacts of the process, just nothing spectacular. Extras Review: Email me if I am incorrect, but I believe this is the first time I have encountered a theatrical trailer included on a Fox Lorber disc I've reviewed. Presented in what appears to be 1.66:1, it is in passable condition; the full-frame home video trailer seems cleaner with brighter levels. Filmographies are included for Fraser, Rossellini, Schell, Sägebrecht, Topol and actor/director Krabbé. Production credits and the usual weblinks are offered as well. 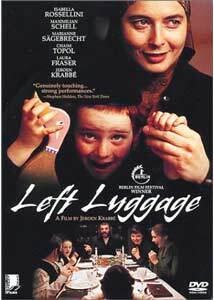 An unbalanced screenplay that cannot serve its characters within its running time, Left Luggage does, however, bring a potentially unique perspective to the effects of the Holocaust upon its survivors and succeeding generations. Recommended for those interested in films concerning the various aspects of the Holocaust or Judaica in general; the fine performances make it worthy of a rental by all.